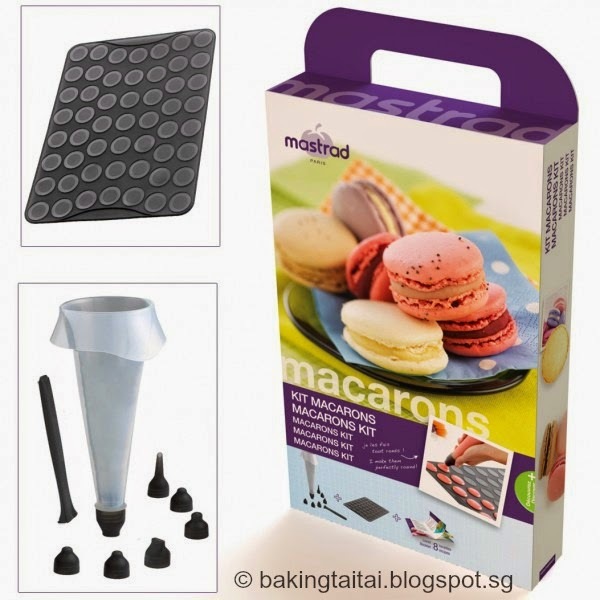 I have also received a box of Mastrad macaron kit to try out. Using this kit, I have made a batch of French method Macarons and I am so glad that it is successful on my first attempt! Though it is not very tall, it is close to the ideal macaron which should have a perfect circle with solid smooth bases, have a ruffled “skirt” or “feet” along the edges where it has risen in the oven, taste slightly chewy and yet crunchy! 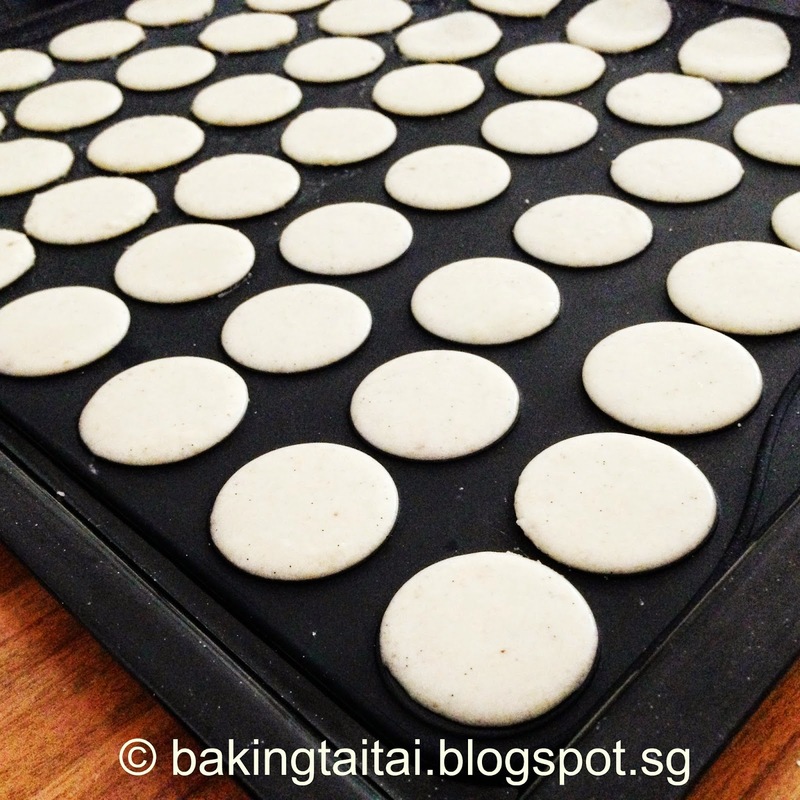 Here's sharing the recipe which I have adpated the basic steps for making french macarons from the recipe booklet that comes with the Macaron kit. I have chosen the natural ingredient - Organic Vanilla bean seeds to flavour the macarons. If you have been following my blog or Facebook page, you would know that I am one who advocates using natural ingredients and avoid artificial colourings and chemicals if possible. For this recipe, I highly recommend using vanilla seeds from the vanilla pod instead of substituting with alternatives as it is the healthiest and most fragrance. 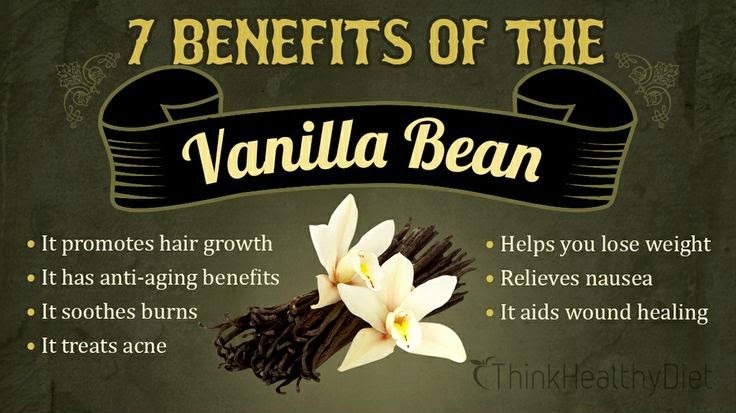 To know the difference between Vanilla bean pod seeds, vanilla extract etc., do click here to find out as I had previously did a comparison among the Vanilla products when I shared the Smooth and Creamy Vanilla custard recipe. 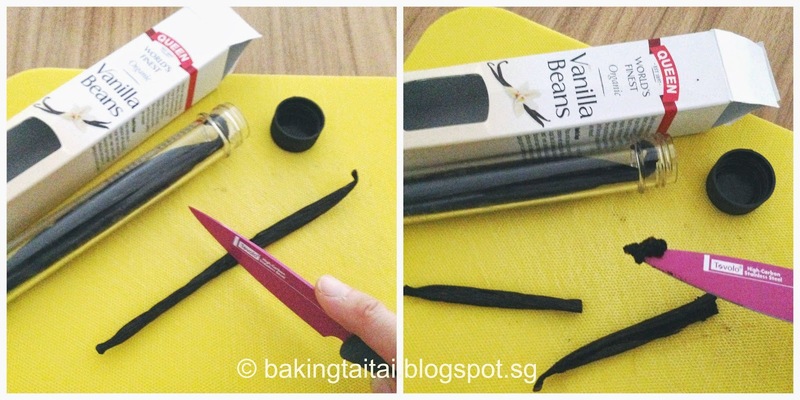 Cut the vanilla pod into half, slice it in half lengthwise to reveal the seeds, use the back of the knife to scrape it out. 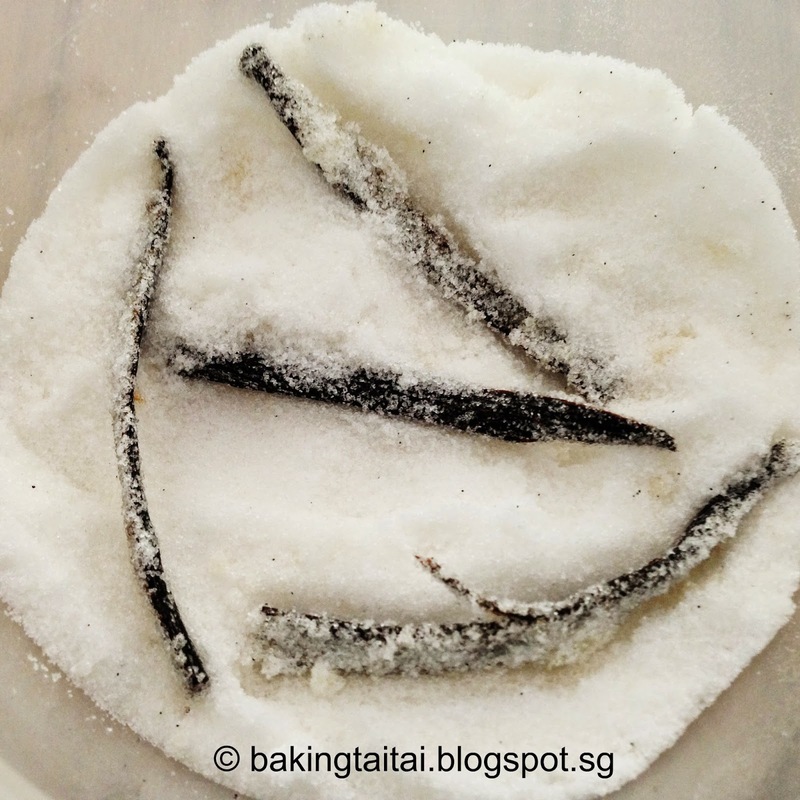 Don't throw away the vanilla pod after scraping out the seeds, You can make vanilla sugar (which is very expensive to buy in store) with it. Vanilla sugar is great in coffee, tea, or sprinkle it over oatmeal and yogurt. 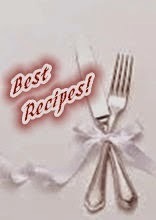 You can also use it to bake cookies, make salted caramel sauce etc. 1. Place the vanilla pod in a glass container with 250g castor sugar. 2. Seal and set aside for 2~3 weeks before using. 1. 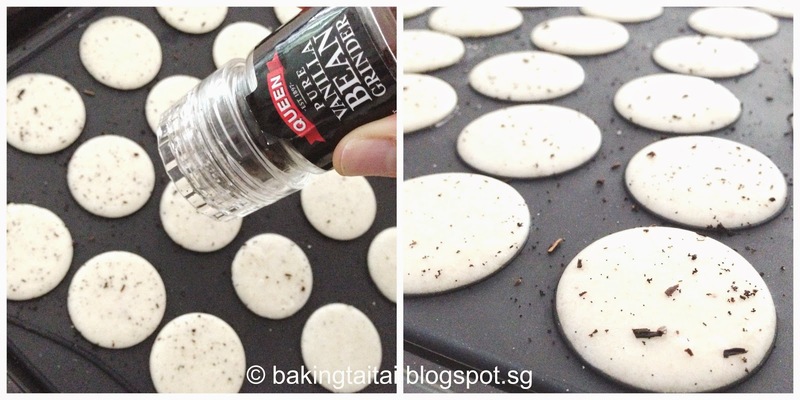 Put the icing sugar and almond powder into a grinder to obtain a fine powder. Sift them into a bowl. 3. Pour in half of the sifted powders to the meringue, using a silicone spatula, fold with about 10 strokes. Then pour in the remaining half sifted powders and continue to fold with about 30 strokes. 4. 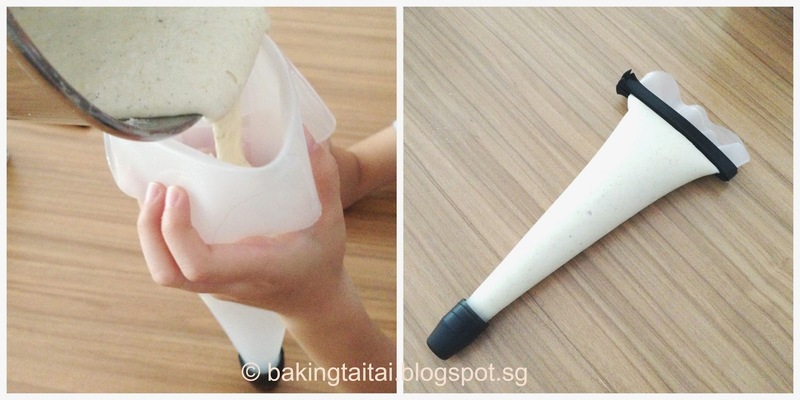 Pour the mixture into a pastry bag fitted with a round nozzle. 5. 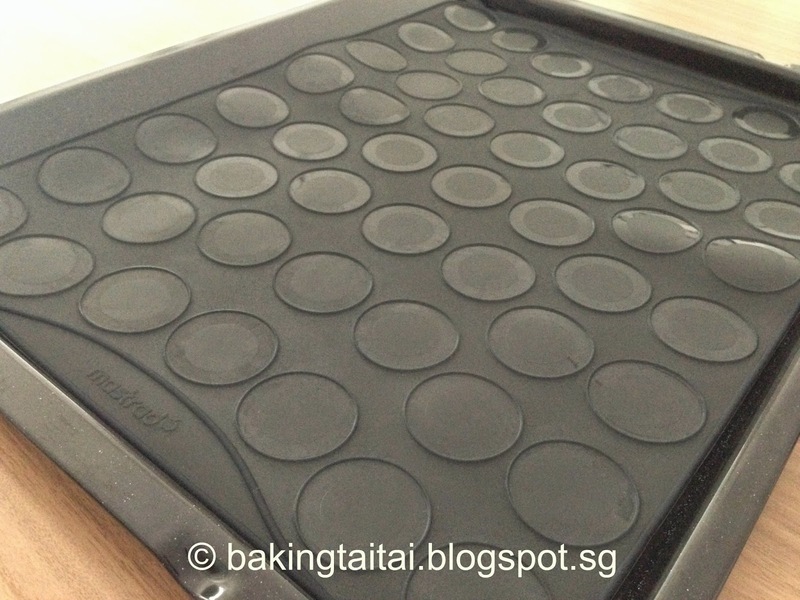 Place the macaron sheet on the oven grill pan. 6. Pipe a small drop about 2cm wide in the center of each indented circle of the macaron baking sheet. 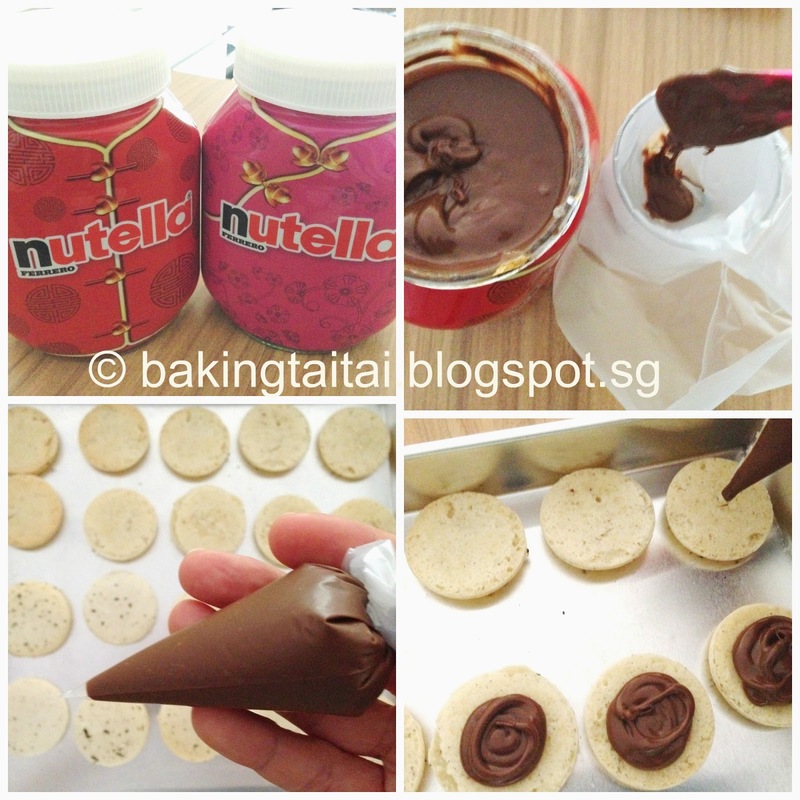 Allow the mixture to spread into the indentations. Lightly tap the grill pan on the counter top to remove any air bubbles. 9. Remove from oven. Wait for the shells to cool completely (approximately 15 minutes) before removing from the baking sheet. 11. Chill it in the fridge, taste best after 24 hours. 1. Do not reduce the amount of sugar or any ingredients when making macarons, it is important to follow and measure accurately! 2. Folding technique - You must go from the center of the bowl outwards, be sure to scrape the spatula along the bottom of the bowl with one hand so as to lift all the mixture at the same time then turn the bowl a quarter turn with the other hand and repeat. 3. The mixture must be mixed until smooth, shiny and slightly runny, but you must stop at the right moment. If over-mixed, it will become too liquid and the macarons will not develop perfect edges during baking. If under-mixed, the macarons will split/crack during baking. All Mastrad products are strictly comply with European Food Testing directive, TUV test and German LFGB safety certified. Mastrad silicone bakewares use 100% premium silicone, have shiny surface to enhance de-moulding. 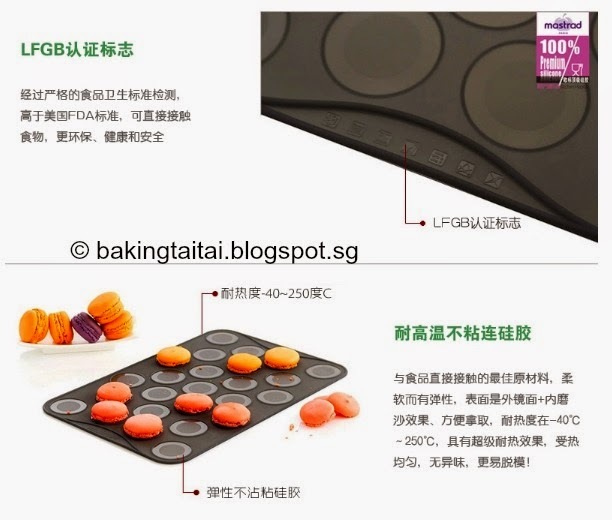 The moulds are designed to have a balance between rigidity and flexibility which means that handling will be safe, not filmsy and have good flexibility for easy release of the cake. Mastrad is also the only bakeware brand that has a patent for its "Rigid handle", thanks to reinforced handles that makes handling safer. - ilovekitchen: K11 and Mega Box. For those staying in Hong Kong, if you do not have a Tmall account, click here to write to Mastrad Asia Pacific Facebook page, place your order and goods will be delivered to your address after payment is made. I have asked Mastrad Asia Pacific for a set of Cupcake Pops kit and a set of Macaron Kit for my loyal readers and followers to try. They are so nice to sponsor it and there will be one winner for each item. 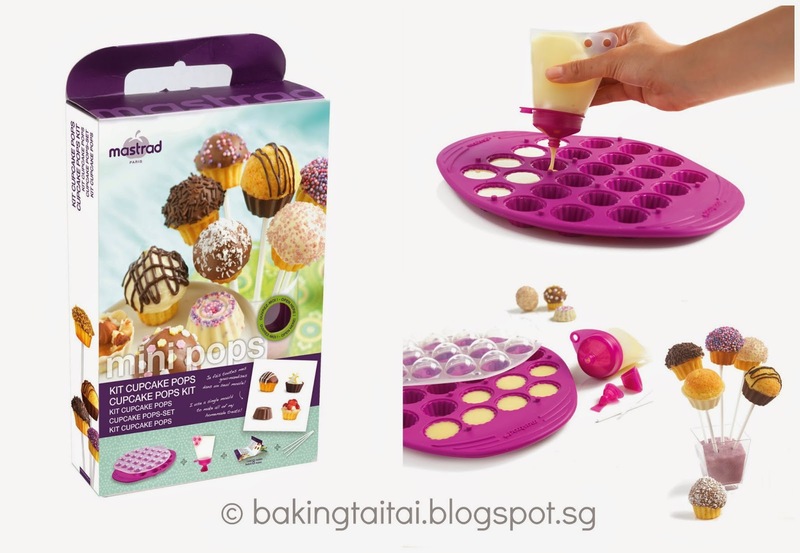 Use the mould with the lid to get sweet or savoury muffins or cupcakes with perfectly rounded tops. 1. This Giveaway is open to Baking Taitai's readers and followers residing in Hong Kong, Malaysia and Singapore. 2. There will be one winner for each item. 3. Enter the giveaway forms below for the item you would like to win, you may enter both. 4. Click here to Like & Share Baking Taitai's Facebook Giveaway post dated 24 April 2015 or 29 April 2015. 5. Giveaway Tools will generate a random winner for each item when the giveaway closed. 6. Winner will be notified by email. If there is no response within 48 hours, another winner will be randomly generated. 7. Prize will be courier to the winners. hosted by Fion of XuanHom's Mom Kitchen Dairy and co-host byDoreen of my little favourite DIY. Your macarons turn out so beautifully.